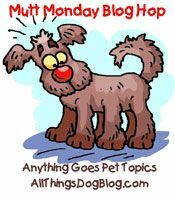 All Things Dog Blog All Things Dog Blog: Mutt Monday--No Hangovers Here! Funny how some plans just don't pan out. I hoped to give away much of the over-abundance of extra samples in my office during the holidays. I ran a pile of giveaways and somehow I still have an office full of....well, let's just say it looks like a pet supply store! My troubles are your good fortune. I'll be continuing to purge the excess--particularly the Winter items--throughout January, while Dogtipper and I prepare for Super Dog Sunday and the #SuperDogPics Twitter Party. I hope you're planning to join us because the prizes are piling up for those events, and we plan to have an awesome time. Care to join in today's hop? This is an anything goes pet blog hop--giveaways, reviews, commentary, training, food, healthcare, you name it. Hope you'll join in this week and every week. See ya soon!